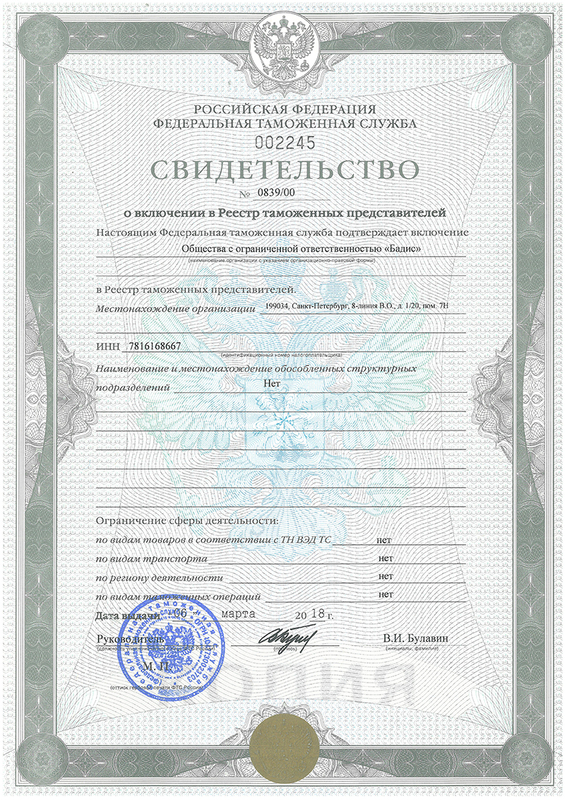 The company has a major experience in submitting customs declarations on various types of goods: oil products, electric appliances, food ingredients, chemical materials, industrial equipment, spare parts, food products, construction materials, tobacco products, vehicles, clothing, metal products, etc. Badis customs agent provides a wide range of customs services at Baltic, Saint-Petersburg, Kingisepp, Pulkovo, Central Excise, Novorossiysk, Moscow Region, Smolensk, Zelenograd, Vyborg, Kaluga, Dagestan, Nakhodka and Vladivostok customs. As we seek to optimize the process and to reduce our clients’ time expenses, we conduct analysis of customs registration documents and preliminary declaration even before the goods arrive. Our team consists of highly experienced import and export specialists that work with various goods types and are familiar with all the peculiarities of customs procedures. We accompany our clients at every step of customs processings, in solving disputes with customs and controlling authorities, in obtaining approval documents according to all the legal regulations. Badis legal services agency represents the interests of clients in commercial courts and courts of general jurisdiction. We render legal support of foreign trade transactions, offer consultations on questions of corporate law, taxation, intellectual property, landed property, land , labor, housing, administrative, customs, transport and the other branches of law. The theoretical and practical knowledge allows us to successfully protect our clients’ interest in the most troubled circumstances and prevent them. Badis legal services agency activity combines the high professional standards and intimate knowledge of specificity of legal law. in solving legal issues of any degree of complexity. Badis freight agency performs management of international forwarding. We provide our clients with wide choice of shipping means along with minimum time and money expenses and transactors. We work closely with the maritime shipping companies, air line agents, railway operators, Russian and foreign trucking companies. Badis freight agency ensures the reliability, high service level, low costs and fast delivery which allows to offer the high level logistics services to our clients. Today Badis transport agency is a company provides full range of services and effective solutions the in transport-forwarding serving of import-export goods at the international checkpoints and national customs terminals. Badis transport agency performs goods delivery from any departure point by road and by rail. We also offer services of intra-port forwarding, repacking, storage and insurance of cargo. We work for 24 hours 7 days a week. Our staff’s operational excellence enables us to successfully meet any challenge occurring during cargo transportation. Our goal is effective cooperation with our clients and optimization of all transport and logistics processes.